HBO's 'Big Love': My Three Wives HBO is hoping that viewers drawn to the inner world of the Mafia with The Sopranos will be equally hooked on the story of a polygamist family in the new series Big Love. 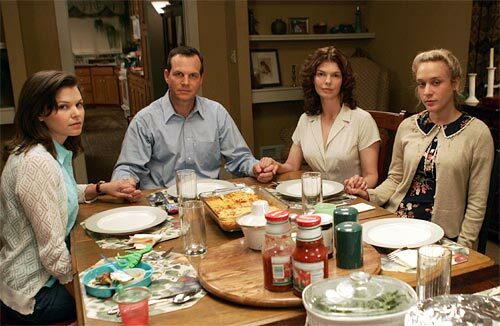 The Big Love cast: From left, Ginnifer Goodwin, Bill Paxton, Jeanne Tripplehorn and Chloe Sevigny. 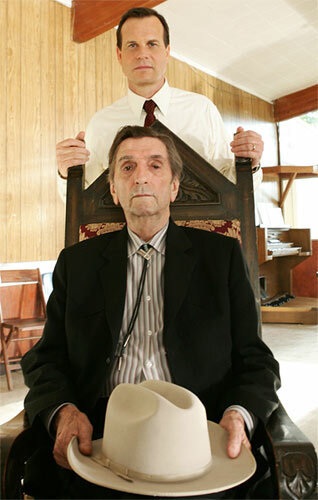 Harry Dean Stanton, sitting, plays the patriarch of the polygamous compound where Bill Paxton's character was raised. HBO introduces a new show in a prime slot -- immediately following the season premiere of The Sopranos. Like The Sopranos, Big Love is the story of an unusual family. HBO is hoping that viewers drawn to the inner world of the Mafia will be equally hooked on life in a polygamist family. Big Love follows the lives of polygamist Bill Henrickson, his three wives and their many children as they try to live life as normally as possible in a typical American suburb. Except for his lifestyle -- and that's a pretty big exception -- Henrickson (played by Bill Paxton) is an average guy. Head of a successful business, he's a good employer, a devoted -- if overextended -- father and a man who really seems to want to make his wives happy. The wives -- ranging from level-headed wife No. 1 to giddy, immature wife No. 3, with very high-maintenance wife No. 2 wedged in between -- vie for their husband's attention both in and out of bed. Though set in Salt Lake City, both HBO and the show's creators have taken pains to make it clear that the Mormon church has banned polygamy and excommunicates anyone who practices it. And while the family is seen praying, Big Love has a largely secular tone as it explores the messiness of a polygamous family's life and all that entails: conflicting needs, financial worries and petty jealousies. Mark Olsen and Will Scheffer, the show's co-creators, say they are not trying to push an agenda with Big Love. They just think of it as a show about what it means to be a family.